Know the email address of a missing Greyhound? Click here to contact them! 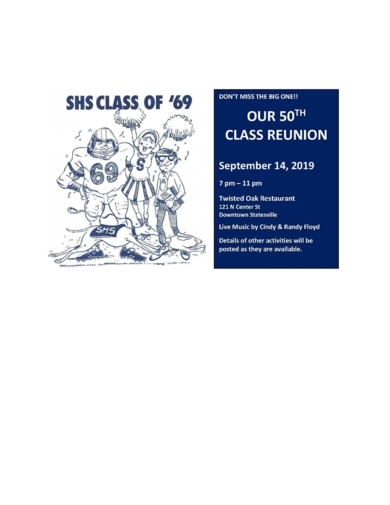 Check out our new Group Facebook page Statesville High Class of 69 to see announcements and news from the Reunion Committee and other classmates. We encourage you to post photos and commentscrelating to our Class of ‘69. Please invite other classmates to join the Facebook Group! There are still classmates we can not locate so need everyone’s help. We will post “the missing” list shortly. 1) Do you plan on attending the reunion on September 14? 2) Could you help us track down the missing classmates?